As we have been warning repeatedly over the last few months, the Powell Fed is totally unlike the Bernanke or Yellen Feds. Former Fed Chairs Ben Bernanke and Janet Yellen were “married” to the bull market in stocks. Indeed, from 2009 to 2016 it became a running joke that the moment the stock market began to break down, Bernanke or Yellen would issue a statement that the Fed was “ready to act” or some other accommodative phrase. Stocks would erupt higher. And the bull market remained intact. Not current Fed Chair Jerome Powell. Powell has made it clear he is going to hike rates until “something breaks.” And he doesn’t meant a minor stock market correction; he explicitly stated that stocks would have to enter a prolonged collapse similar to that of 2008 for him to change the Fed’s monetary policy. Well, he’s going to get what he asked for. 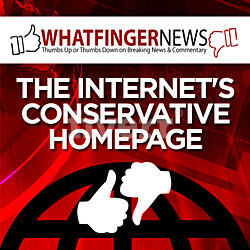 The US Bond Bubble, which I call “the Everything Bubble” is beginning to blow up. 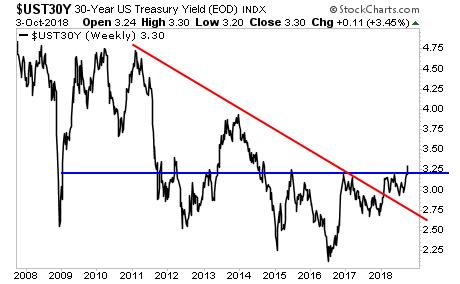 As we noted previously, the yield on the all-important 10-Year US Treasury has broken its multi-decade downtrend (red line). That was bad enough… but now yields have risen above CRITICAL resistance (blue line). THIS was the proverbial “line in the sand”… the line which yields needed to NOT break. And they just did. This move is not exclusive to the 10-Year Treasury either. 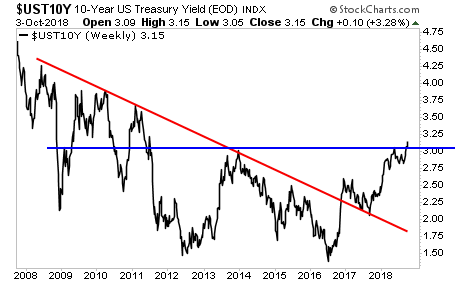 The 30-Year Treasury has ALSO broken its restively downtrend (red line) and CRITICAL resistance (blue line). This is a MASSIVE warning to everyone. If you wanted a comparable situation… this is the equivalent of when subprime mortgages started blowing up before the last crisis. The only difference is that bubble in mortgages/ real estate was a bubble in a relatively senior asset class. The bubble in sovereign bonds is a bubble in THE MOST senior asset class… the bedrock of the entire global financial system. Did the next crisis just start? We are about to find out! I am currently looking for a -30 to -40% correction in SPY by mid-March 2019. Will I be right?